Moorsetown, New Jersey – The Young Masters Little Wisdom Discovery Program is in full swing at Montessori Children’s House as students jump into unit four in this six week program. Spontaneity is a beautiful thing! Class began with an unexpected, but perfect, twist today when the children were frightened because of a spider. They were reminded how they can be brave even when confronted by a spider as Miss Stephanie’s showed them how she could pick it up with a dust pan and bring it over to a door so it could be set free outside to roam where spiders have unlimited crawling space. Class was off and running! The children were excited to meet a new character in this week’s book Heart Of A Lion. Her name is EEtha. In the fourth book of the Young Masters Little Wisdom series EEtha joins Butaan and Phylos as they travel through the magic garden learning about the secrets of the heart. It was like meeting a new friend. 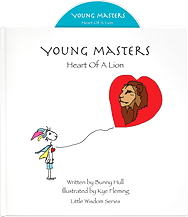 Together the children proudly state THE YOUNG MASTERS PLEDGE and discover today’s Secret Of The Heart ~ COURAGE. In Heart of A Lion, Phylos has a choice to be afraid or to face his fears with courThey discuss why Phylos is afraid and how his friends help him face his fears. They children notice how Buttaan and EEtha help Phylos face his fears by encouraging him and helping him believe in himself. They talk about how they can help their friends, brothers or sisters face their fears. The children are asked how Phylos would have reacted if his friends had put him down or made fun of him and how afraid he felt. “Would Phylos would have found his courage if they had done that?” asked Miss Stephanie. The children agreed that friends can help you face your fears and it’s important to encourage each other. The children were then presented with their POWER BADGES. 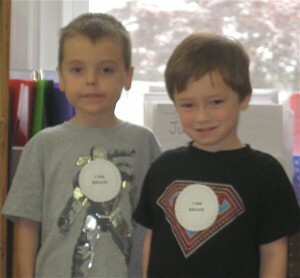 Each child wore a special message: I BELIEVE IN MYSELF. I AM BRAVE. I AM HEART SMART. I HAVE COURAGE. I HAVE FAITH. I CAN DO IT. They talked about times when they needed to be brave, like when they were at the doctors office and needed to get a shot or at night if they were feeling afraid of the dark. They then discussed how important is it to believe in yourself when when you learn something new like how to tie your shoe, play a musical instrument or maybe when you’re trying something for the first time like standing up to speak in front of the class. Instead of saying “I can’t do this,” or “this is too hard,” there’s something you can do. You can see the light bulbs begin to go off as they realize they can even encourage themselves by remembering to think or say positive messages like I CAN DO IT. They can practice, work hard or ask for help if they need it. A little self-talk goes a long way. A breakthrough moment in today’s class happened when one little girl who is often too shy to participate stood up and walked to the front of the classroom to receive her special POWER BADGE. The badge said I HAVE COURAGE. “I Have Courage,” she said. “Way to be,” said Miss Stephanie. 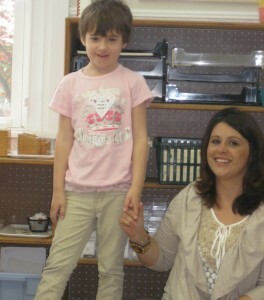 “She gently faced a big fear” said Miss Stephanie, and took a giant step forward with that small act today. When the Power Badge was placed across her heart she gave a big smile and even had her picture snapped. A snapshot of courage in a world that can sometimes be a scary place. The children took home a small gift today. A smooth rock that they will decorate with the affirmation that’s on their POWER BADGE. A touchstone to remind them “I believe in myself.” Courage rocks! That’s the lesson from today’s Young Masters Little Wisdom Discovery program. Stay tuned for next weeks lesson, unit five – The Invisible Power – everything begins with a single idea! The Young Masters Little Wisdom Curriculum for Montessori is currently available for free to all you wonderful teachers by clicking here.